In a rematch of last year's Stanley Cup Final, Ryan Reaves and Tom Wilson picked up right where they left off. Chipping in with power-play marker in the first period while throwing his big body around for five hits, the Golden Knights enforcer was assessed a game misconduct to go along with his five-minute major deemed as an interfence for when his hit on Capitals forward Tom Wilson. With Wilson looking in the opposite direction, Reaves blindsided him, causing him to lose his helmet before slamming his face hard on the ice. The hit caused him to be helped off the ice where he left the game with an "upper-body injury." When reporters caught up to Reaves post-game, Reaves didn't hold back when describing what he called a legal hit. "That was a man's game out there...I thought he was just looking at his pass, and he ran into a lion in the jungle," said Reaves. "If he sees me, I know he's gonna try and lay me out and I'm not gonna let that happen. I thought it was shoulder to shoulder and I didn't think it was that late." Gerard Gallant agreed with Reaves' assessment of the hit. "I think we all seen the hit and video, it's a clean hit, there's nothing wrong with the hit," he said. "Unfortunate a player got hurt, but it was a clean hit." With the Caps having the day off on Wednesday, Isabelle Khurshudyan reports that an update on Wilson will likely be released come Thursday. Reaves will receive no further discipline. 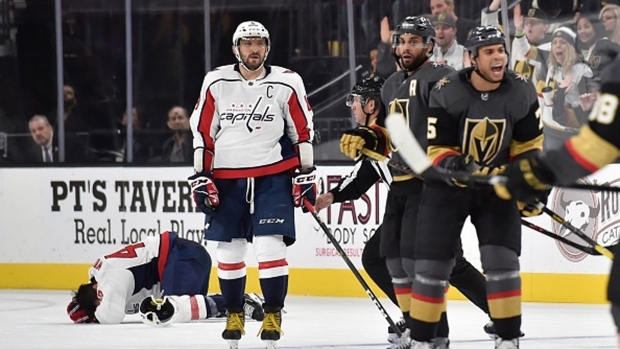 The Golden Knights went on to defeat the Caps lead by former Washington defender Nate Schmidt. The only time these two teams could play again this season is if a rematch occurs in this year's Stanley Cup Final.